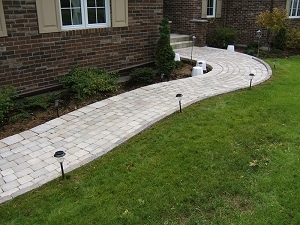 Walkways can be both very practical and very artistic. 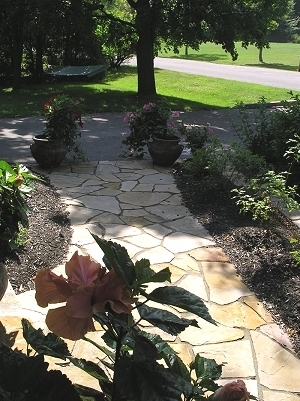 Front walkways should be both as they invite you into a home while at the same time making up a key element of the front yards design. 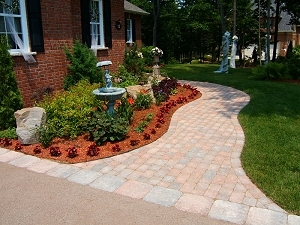 Often times a beautiful curving walkway is also the framework to an abundant flowerbed, and the two compliment each other superbly. 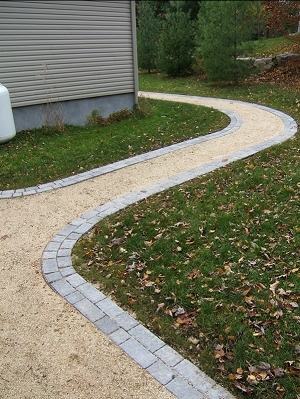 Slowly meandering walkways are also great to connect different areas of a property, and add substance to the open areas they traverse. 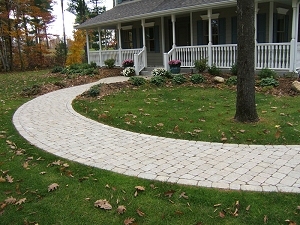 Uni-stone is an excellent choice for walkways. 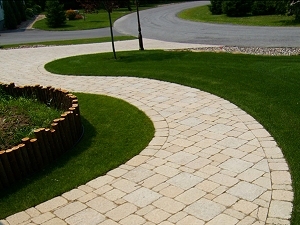 It offers a huge array of choice with respect to colour, texture, style, and pattern, and the stones are highly resistant to weathering. 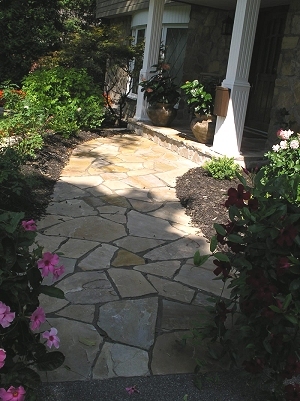 If the goal is a more natural and rustic look, flagstone is a beautiful material to consider. 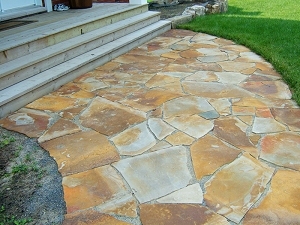 Available in a selection of colours, every flagstone walkway is unique in its craftsmanship when installed in a crazywork pattern. 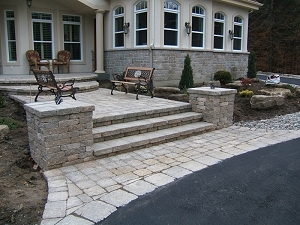 Our skilled craftsman take their time and chisel every individual piece of stone to fit into place, with great care being taken to ensure small, equal sized gaps between the stones. 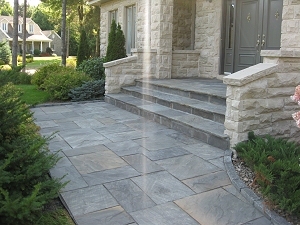 Natural flat stones laid in a modular pattern offer an interesting alternative to crazywork flagstone if the desired result is a more delicate style with a natural stone. 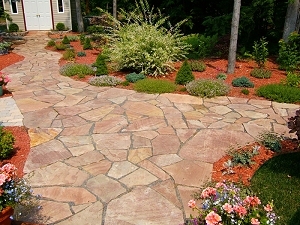 These stones can also be had in wide range of colors. 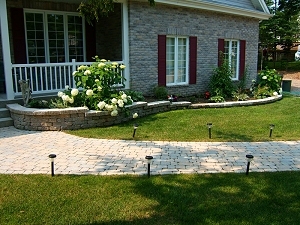 Also rustic in its appearance, but much less time consuming to install, is stabilized decorative crushed stone. 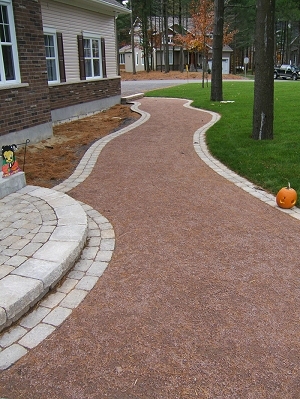 This material is highly compactable, and comes blended with a stabilizing agent, thus greatly reducing the chance for ruts or weed growth to occur. 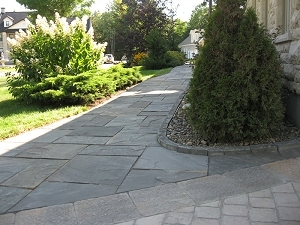 Available in a large selection of colours, this stone is ideal for walkways of large dimensions.